The Territory’s role in facilitating Chinese enterprises in cross-border trade was highlighted at the second International Sister Cities Roundtable Conference held in Shenzhen on November 17. Executive Director of BVI House Asia, Ms. Elise Donovan addressed the conference and spoke about the vision of stronger ties between the British Virgin Islands and Shenzhen in various fields, such as financial services, tourism and education. Twenty-six official representatives from 15 cities and regions around the world attended the five-day conference, the goal of which was to promote exchanges and partnerships between Shenzhen and the rest of the world. 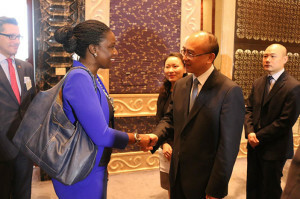 To date, Shenzhen has 63 sister and friendship cities in 41 countries. The BVI and Shenzhen signed a Memorandum of Understanding in January 2014 to further increase friendship, expand exchange and cooperation, and enhance friendly relations.